Santa Duc was founded in 1874 in Gigondas. Duc is the name of an owl, which has sensibly selected Provence as its preferred home. The Duke of Gigondas is the irrepressible Yves Gras, the 4th generation of winemakers at the property, whose aspiration is to forge an identity for this Medieval appellation that sets it apart from all of its neighbours. The domain has 13 ha in Gigondas and 10 ha in the Rhone Villages wine appellations of Rasteau, Cairanne, Sablet and also produces some of the best buys in Cotes du Rhone (Les Quatres Terres), a Vin du Pays de Vaucluse and a Cotes de Ventoux Blanc. 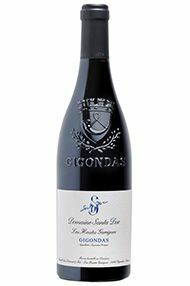 The range of Gigondas cuvess at Domaine Santa Duc includes the Cuvee Tradition and Les Hautes Garrigues (made in only the best vintages) and in 2007 a new, 100% Grenache, limited production (4,000-bottles - from 80yo vines) cuvee (Gigondas 66) has been released. All three of these Gigondas are thrilling wines of top-notch quality. They set reference points for what Gigondas can be. The blend this year is approximately 73% Grenache, 20% Mourvèdre and 7% Syrah, the last of these three making an unusual appearance in recognition of Yves’ admiration of this variety in 2012, a year when Mourvèdre had to work hard. Be that as it may, it has all its customary savoury spicy richness, with ripe black fruit at its core and a fine, gently minty freshness on the finish. The ebullient Yves Gras can always be relied upon for a sound-bite or two; 2012 is for him an excellent vintage because for him a long season, so far south, engenders inevitable complexity and balance. The wines are getting even better during élevage, he adds, risking a non-sequitur… but I am disinclined to argue with such a robust character and the wines share his forthright salty charm. A stunning old-vine cuve, potent and layered, still developing in new oak (it will benefit from over 20 months in total), this is a Grenache which suggests future indulgence. Deep, dark fruits combine with firm acidity to underpin a structure of Doric ambition. As the name implies, this cuvée is from the higher vineyards, its freshness and lift inspiring beyond the power and concentration of the mid-palate. Hitherto understandably reserved, the wine has real purity and great potential. 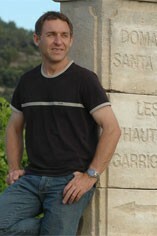 The Duke of Gigondas,Yves Gras, is a charismatic and eloquent champion for these two great villages, easing them out of the shadow of Châteauneuf-du-Pape and into the light of a recognition which is far removed from an outdated reputation for rustic tannins and indulgent alcohol levels. The recognition garnered by the estate is evidenced by a most impressive new tasting room, complete with furniture which would not be out-of-place in a Parisian salon. Fame has its cost however; at the end of our visit a huge lorry, collecting wine to go to Holland, crushed a hundred year-old olive tree, much to the chagrin of M Gras and the eldery M Gras père, who rushed out to castigate the driver with some very colourful patois.